Hindustan Tin Works Ltd. is in portfolio of Subramanian P. He is one of the top investors in India. The company belongs to Chemicals sector. As per the Company website it produces Gelatine from Ossein . The product is fit for consumption in halal and international markets, which has paved a way for export to USA, the EU, Japan, Korea, Middle eastern countries and Indonesia. India Gelatine and Chemicals have factory in Vapi Gujarat. It has office in Mumbai. The chart looks like steps. It moves up then consolidates slowly comes down and again moves up creating long flat lines with sudden up movement.If you see 2002 price and current price it has given 4 times return in past 16 years period. This is not great by any means. But in these years it has not shown any negative growth or movement in prices. All the price drops were after price increase. This is healthy sign for any company. The dividend yield is 2% at current market price. So the 2002 investors are getting 8% dividend. Any company which increases in value and pays good dividend is always desirable by investors. 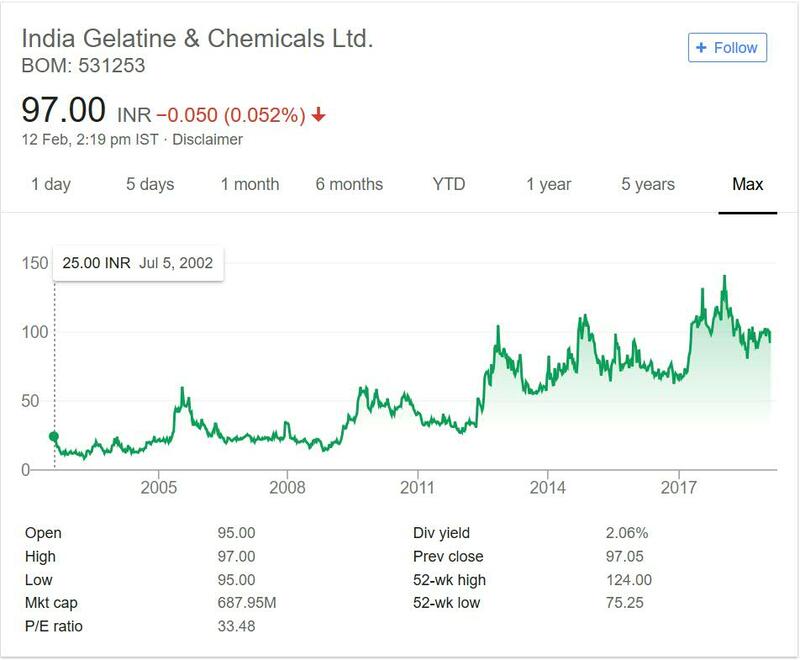 India Gelatine and Chemicals is in Chemicals sector. It is one of the marquee names in Gelatine manufacturer in India and perhaps the only dedicated Gelatine players listed on stock exchanges. This makes it unique company. The growth of Company depends on adoption and usage of Gelatine in other industries. Growth in Indian industries which consume it as raw material will boost the performance of the Company. Chemicals sector has given some multi baggers in past. The sector has too many companies listed. Most of them are unique in products they prepare. I have already invested in Chemicals sector and do not want to increase exposure to single sector.In case you are interested then you can track the company by adding it to your stock watch list. That way you can keep close eye on the Company.